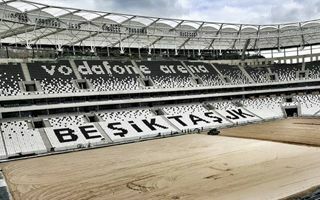 Beşiktaş were due to open their new stadium exactly this week. That didn’t work out, but the delay is to be a small one. New goal: first game on April 9. And not just any game, but against the most intense rival from outside Istanbul: Bursaspor. To hold the game at Vodafone Arena, handover proceedings need to start soon. No wonder that work is in full swing at all fronts, day and night. Yesterday in the afternoon the last segment of PTFE membrane was installed atop the stadium, completing the cable roof. First strip arrived in mid-February, as soon as the weather allowed it. There’s still a lot of work at heights to be delivered as speakers and floodlighting are being mounted. Two giant screens are also ready to be put in place. Almost all black and white seats are in place, only excluding the business and press zones in the west stand. Even part of the comfortable seating within 147 skyboxes are already installed, just waiting for the protective foil to be removed. Preparations for the field installation are well advanced too. All of the basis layers are in place, including drainage and heating. On Saturday the first strips of grass will be laid, already awaiting in trucks outside the stadium. By the way, it should be noted that fans will be seated very close to the field. Along the sides it’s just 6.15m and on both ends it’s 7.95m, almost as close as regulations allow. This wasn’t just caused by efforts to maximize atmosphere, but rather due to extreme site constraints. As if the tight plot wasn’t enough, there were also height and depth limitations put upon this 41,903-seat stadium.